We searched for a romantic getaway, an escape from summer heat, exciting new destinations, spectacular scenery, and a chance to to learn a little more about our world — all at an affordable price. We searched the brochures and found it all with Holland America’s Northern Isles Adventure. The cruise began in Copenhagen and continued to Norway, the Faroe Islands, Iceland, Greenland, Newfoundland, and New York City. There were breathtaking fjords, spectacular volcanic islands, thundering waterfalls, spurting geysers, Ice Age glaciers, and colorful dancing Northern lights. 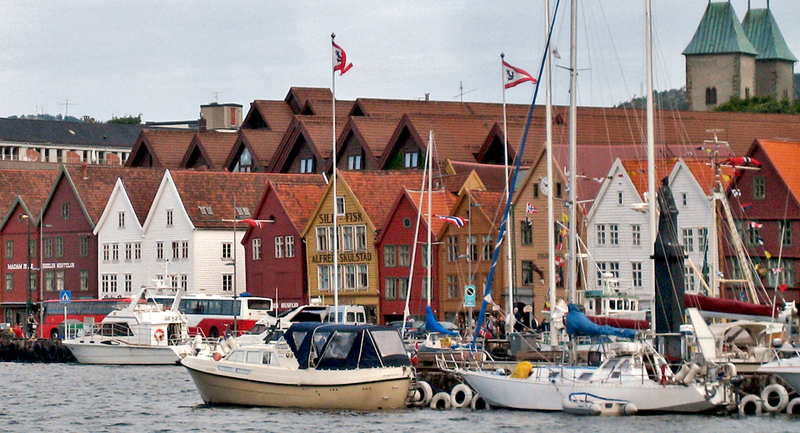 The cruise included charming villages and dynamic cities, encounters with flaxen-haired Scandinavian children in woolen sweaters, being welcomed by young Inuits in traditional sealskin costumes, spotting dolphin and whales, and gaining a little better understanding of history and life built around the sea. By cruising, we traveled this range of destinations and experiences in comfort while enjoying the fine dining and the gracious services of our floating resort. We spent our time exploring these destinations without a concern about getting there. This time we splurged on stateroom with a private veranda, where we could stretch out to the sounds and rhythms of the sea and enjoy brilliant sunrises, spectacular sunsets, romantic moonlit nights, and some of the most dramatic landscapes on earth. There were views beyond our imagination and pure North Atlantic air. Holland America has added features to cater to the premium traveler, like luxurious bedding (available for purchase on its website in response to customer requests), and spa-grade toiletries. 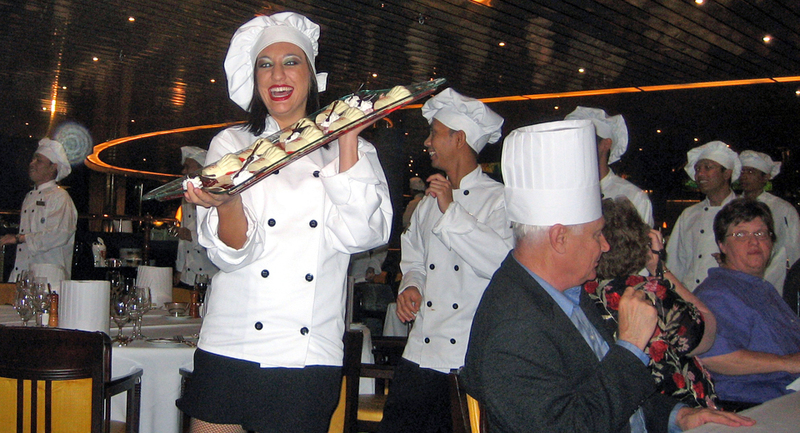 Sea days were opportunities to savor delectable samples and learn to cook like the pros in the Culinary Arts Center (Grand Marnier Chocolate Volcano Cake, Dungeness Crab Cakes with Thai Sweet Chili Sauce). Explorations Café, replete with express bar, has the ambience of an upscale high-tech book store. It’s a place to catch up on reading, check email, or enjoy music at the listening stations while gazing at the sea. To soothe the body and soul there’s the top-rated Greenhouse Spa with ancient and modern rejuvenating treatments from around the world. 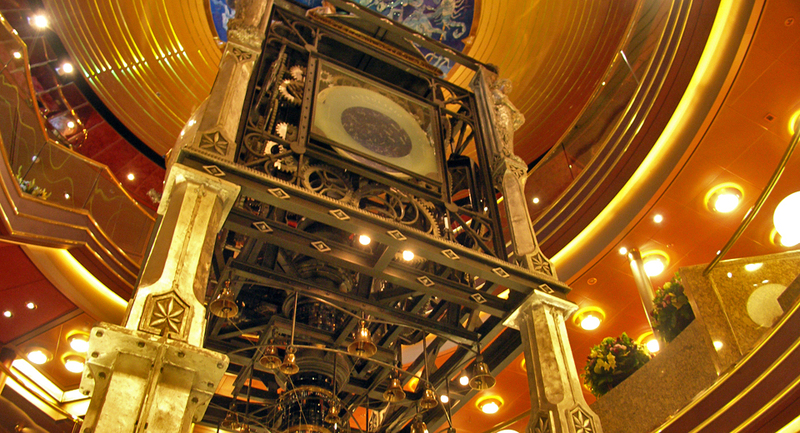 The Planeto Astrolabium is suspended in the Amsterdam’s three-story atrium, tracking constellations, the planets, world time and ship time. We could catch a movie in our room or in the Wajang Theater, join in on games, take a dance or exercise class, catch the game at the Sports Bar, or simply relax by the pool. The Explorations Speakers Series in the Queen’s Lounge was an opportunity to learn more about the places we would visit with presentations by a geologist, an historian and a NASA veteran. Evenings, we enjoyed the cocktail of the day in whichever lounge matched on our musical entertainment preference or danced at the Crow’s Nest, high atop the ship. And then there were the special events, like the Dutch Chocolate Extravaganza. Nightly shows in the Queen’s Lounge were typically Holland America — with Las-Vegas style revues, comedians, illusionists, vocalists, and talented musicians. Performances by pianist Hyperion Knight, from Gershwin to Rachmaninoff, received well-deserved standing ovations. It was tempting to remain onboard the Amsterdam, but the ports were simply too alluring. One of the reasons I recommend Holland America so highly to friends and family, in addition to their best value in the premium market rating, is that their port lecturers provide personalized information not only for their own shore excursions but also for exploring independently. My only complaint is that a 10% service charge is now added for onboard cancellation of shore excursions made before the cancellation deadline. Nevertheless, I continue to recommend booking in advance those that you do not want to miss. Popular excursions can fill up quickly. Travel tip: In cities like Oslo and Bergen, if you will be visiting a number of museums and other attractions independently, you may want to purchase their city card at the Tourist Information Office. These include admissions, use of public transportation, and a variety of discounts. The oldest of the Scandinavian capitals, founded over a thousand years ago, Oslo was an important center of wood trade. In the 1600s, after yet another devastating fire, King Christian IV, ruler of Denmark and Norway, rebuilt the city in brick and stone closer to Akershus Fortress and named it Christiania after himself. The original name was not restored until 1925. At the head of a 60 mile long fjord, surrounded by forested hills, lakes, and farms, the approach is superb. 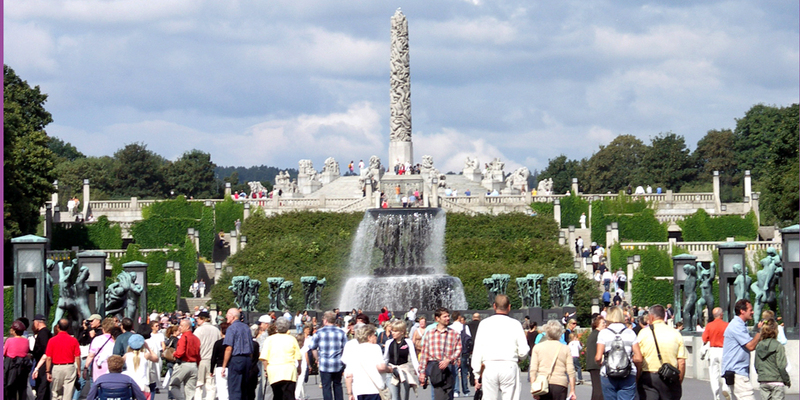 Oslo proper is easy to tour on foot or with public transportation. Then plan to spend most of the day at the network of maritime-themed museums amidst beautiful Norwegian homes on Bygdøy Island. (Public Ferry #91 by City Hall or bus #30). Viking Ship Museum—The best preserved Viking long boats, like the 9th century Oseberg, are displayed with their contents. Open Air Folk Museum—Stroll amidst 155 traditional buildings from all over Norway, including a 13th century stave church from Gol, and watch traditional crafts demonstrated. Kon Tiki/Ra Museum—See the original vessels from Thor Heyerdahl’s expeditions testing the possibility of early migrations of man. Norwegian Maritime Museum—Art and artifacts showcase Norway’s seafaring history from Viking times. Polarship Fram Museum–The world’s strongest wooden vessel, designed to float with an ice sheet, went farther north and south with its polar expeditions than any other. City Hall (Rådhuset), decorated by leading Norwegian artists with impressive murals depicting Norwegian culture and history from its rural beginnings. The Nobel Peace Prize is awarded here. Head back toward the cruise port and climb to Akershus Fortress –Built high above the harbor area by King Haakon V in the 1300s as a medieval castle, and rebuilt in Renaissance style three centuries later, it is Oslo’s oldest and most historic building. It was occupied by the Nazis during World War II, a time archived in the onsite Resistance Museum. Holmenkollen Ski Jump and Ski Museum— Site of the 1952 Winter Olympics. Enjoy fantastic views from jump tower and visit the world’s oldest ski museum. Try the ski-simulator of the toughest downhill runs. .
Museums–—The National Gallery, Historical Museum, and Museum of Decorative Arts and Design, are found behind and to north of the university. There is also Edvard Munch Museum and the Ibsen Museum, the playwright’s last home. Nobel Peace Center—Oslo’s newest cultural attraction, in a former railway station, presents the work of prize winners and interactive exhibits on war, and peace, and conflict resolution. Shopping—Expensive in Norway, but high quality. 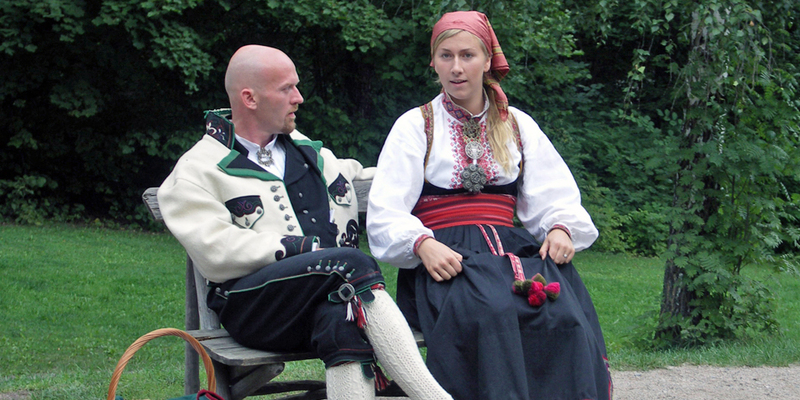 Look for Norwegian sweaters, pewter, woodenware including some with Norwegian decorative painting known as rosemaling, skiwear, and trolls. Karl Johans Gate is the shopping major boulevard, mostly pedestrian-only, with exclusive store Paleet, Parliament, the National Theater, the University and the neoclassical Royal Palace (Changing of the guard, 1:30; Gardens open in summer.). There’s more shopping by the harbor at lively Aker Brygge. Back onboard after a busy day, we relaxed on our veranda and listened to the narration by the Port Lecturer as we sailed away along scenic Oslofjord. Founded by King Christian IV in 1641, Norway’s second largest harbor is a major Norwegian port for fish and wood products and a seaside resort. Ship excursions include city tours, boat trips to charming Lillesand, scenic train rides on a narrow-gauge steam engine, or a visit to Setesdal Mineral Park. Kristiansand is easy to explore on your own. We browsed the fish market, strolled past the traditional wooden houses in the old district of Pasebyen, visited Norway’s largest church, and enjoyed the view from the Christiansholm Fortress area .There is a ferry harbor, plenty of shopping, and superb seafood in the harbor area restaurants. We returned to the Amsterdam in time for mid-afternoon Royal Dutch High Tea, replete with scones, dainty sandwiches, and tasty desserts. Later, we celebrated our anniversary with a romantic meal by candlelight at the Amsterdam’s Pinnacle Grill, known for Sterling Silver beef, fine wines, and elegant creations beautifully plated and served with style on Bulgari china. 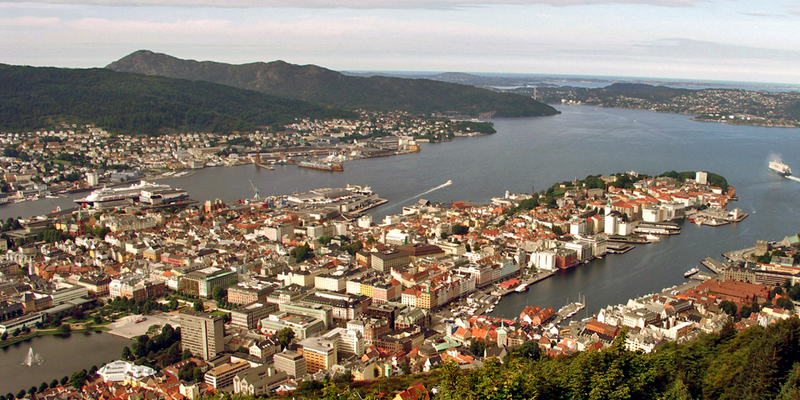 Cosmopolitan Bergen is a cultural and commercial center rich in Old World charm. World Heritage City and one of the most visited cruise harbors. A chief shipping center of Norway, and its first capital, Bergen was one of Scandinavia’s most important cities in the Middle Ages. Shore excursions include tours of Mt. 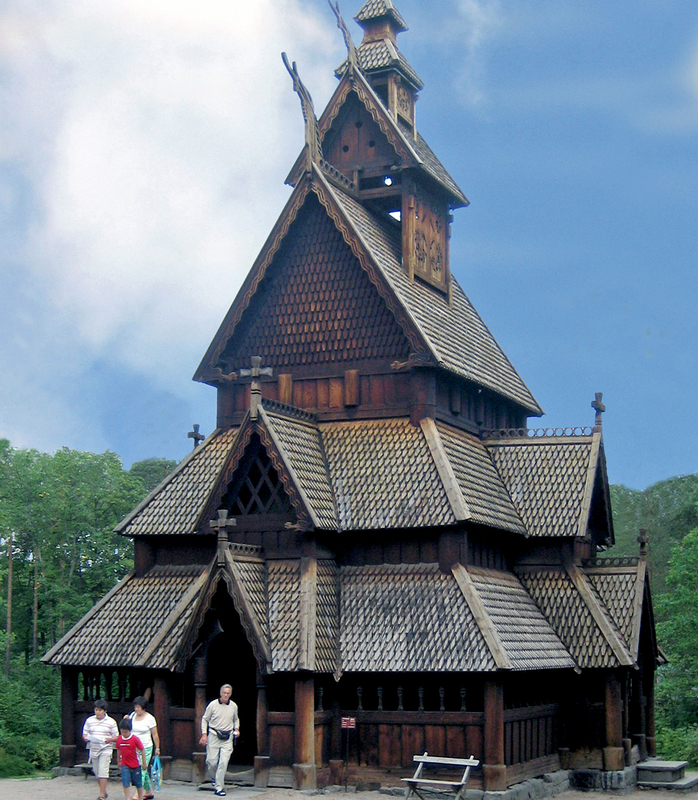 Fløien, Bryggen and the famous Fish and Flower Market, quaint villages, scenic forests and cascading waterfalls, and Troldhaugen and Fantoft Stave Church. On your own? Take the Fløibanen Funicular up 1050’ Mt. Fløien for a birds-eye view of the city and harbor. You can hike one of the paths or take a break at the café before heading down to the colorful wooden waterfront warehouses of Bryggen, a UNESCO World Heritage Site. Here, the Hanseatic League, a German medieval guild of merchants, dominated Northern trade routes for 400 years. Visit the Bryggens Museum, site of archaeological finds from the Middle Ages. Meet at the entrance for guided tour of the carefully preserved area. The Hanseatic Museum, recreated living quarters of a 16th affluent merchant, is the oldest and best preserved wooden houses of the Hanseatic period. St. Mary’s Church is the city’s oldest building still in use. Romanesque and Gothic, built in the 12th century, inside are a late medieval gilded triptych and a pulpit of fine Norwegian Baroque decorative art. There is also Rosenkrantz Tower and Håkons Hall, the royal residence when Bergen was the political center of Norway, an aquarium, art and natural history museums, Troldhaugen, the home of Norway’s best-known composer, Edvard Grieg, and even a Leprosy Museum. Leprosy is also known as “Hansen’s disease” for the Norwegian doctor’s discovery of the bacteria that caused the disease. These will have to wait until our next visit. We departed through Hjelterfjord, passing Norwegian oil rigs on port side in evening. We continued our cruise, tracing pathways taken by the Vikings over a millennium ago. It was a voyage that far exceeded our expectations.